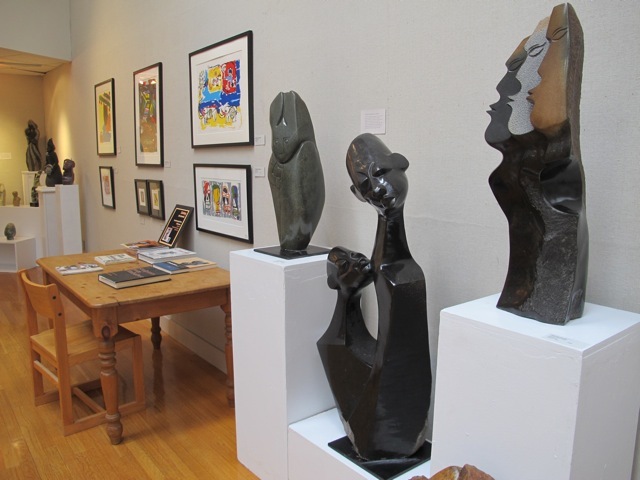 There’s a new visual treasure trove on exhibit at the South Shore Art Center in Cohasset, MA now through November 3, 2013. This collection of carved stone sculptures has been in hiding since the closing of the Reece Galleries in New York City in 2008. The exhibit entitled “Transforming African Modernism: 25 Years of Zimbabwe Stone Sculpture (1980-2005)” consists of beautifully crafted and designed stone sculptures with clean lines and an appreciation of both the subject of the pieces while showcasing the aesthetics of the stones that are used for their creation. Facing the Future by Chituwa Jemali. 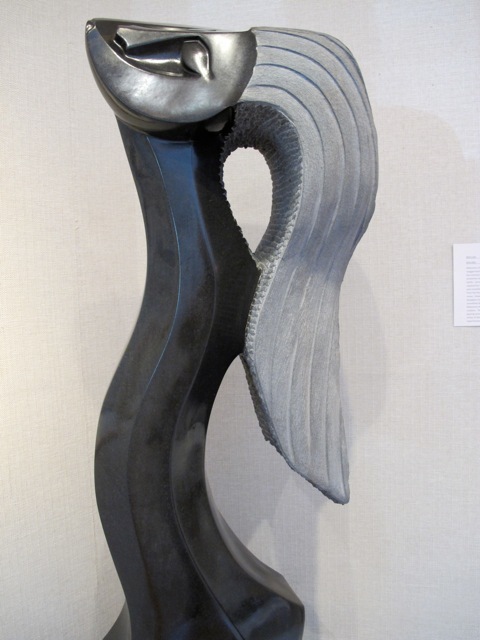 Many of the show’s pieces depict the female figure as does this large sculpture by Chituwa Jemali. This stone carving has a simplistic, modern look that is elegant and regal with it’s elongated, curving neck and flowing hair with her chin in the air with a half moon face. Like it’s title, ‘Facing the Future’, it projects a strong, confident women ready to take on the world and at 475 lbs. she has an impressive presence. A variety of stone figures are on display. One of my favorite corners of the exhibit is this display of many various female torsos. All shapes and sizes made with an assortment of stones that enhance the beauty of the figures. All of these inspired sculptures have the option of adding a simple stand that enables the piece to be rotated easily for viewing. Woman and child sculpture by Colleen Madamombe. This is a charming piece by Colleen Madamombe has a light and airy appeal that combines roughly textured and softly smooth stonework. A wide selection of artists are represented in the exhibit. There’s an earthy, modern appeal with an array of styles and artists represented in the exhibit. Black & white linotypes along with Basquiat-style silkscreens line the walls with unframed prints available as well. 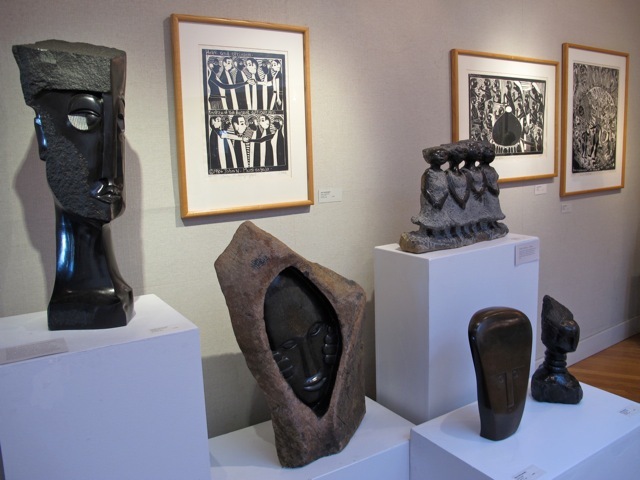 Zimbabwe prints and sculptures line the walls of the Bancroft Gallery. For more in-depth information about this exhibit there’s a gallery talk this Sunday, September 29th, 2013 at 4 pm with curator Russell Schneider at the South Shore Art Center at 119 Ripley Road in Cohasset, MA. There’s also a very informative article in the current Sept/Oct issue of Artscope Magazine written by Donna Dodson. 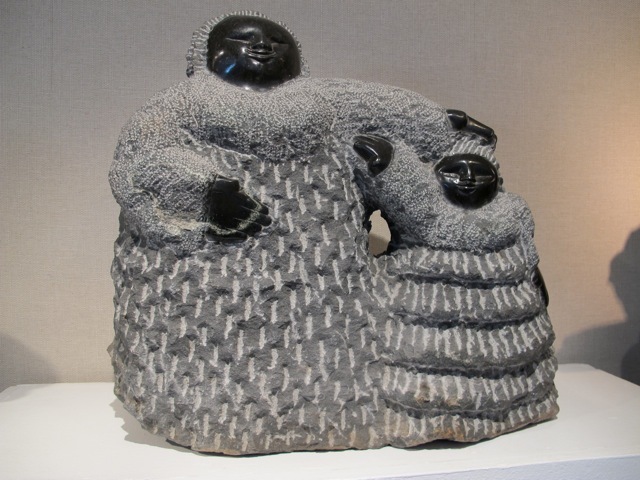 Get out and enjoy this inspiring exhibit of modern Zimbabwe stone sculptures right here on the South Shore of Massachusetts. The majority of pieces are available to purchase. 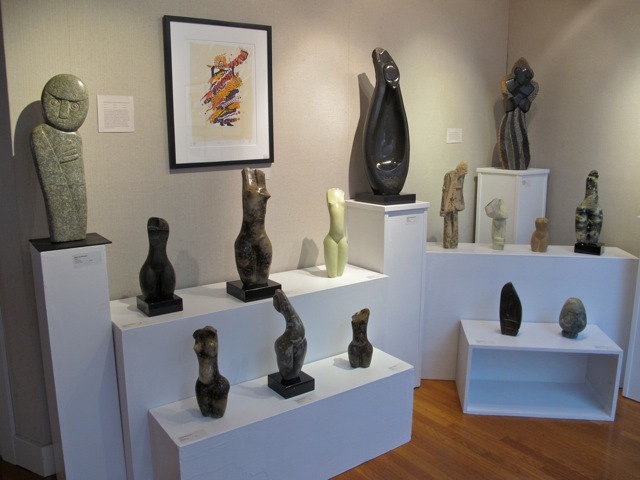 You are currently reading Zimbabwe Stone Sculptures at the SSAC at donna ingemanson studio.